If you're the kind of person who un-ironically owns a ceramic teapot and/or the kind of person who rates a man by the contents of his bookshelf, you're about to discover your next favorite tea supplier. NovelTeas is a Northern California-based company that specializes in selling book-shaped tea tins with a literary tea pun. Whether you're a fan of Renaissance literature or Victorian literature, leaf tea or herbal, NovelTeas has a punny, literary tea for you. The original selection of NovelTeas included three varieties: Oscar Wilde's The Picture of Earl Grey, Leo Tolstoy's War and Peach, and Miguel de Cervan'Teas's Don QuixoTea of La Manchai. Are you groaning with pun-overload yet? Because there's plenty more where that came from. 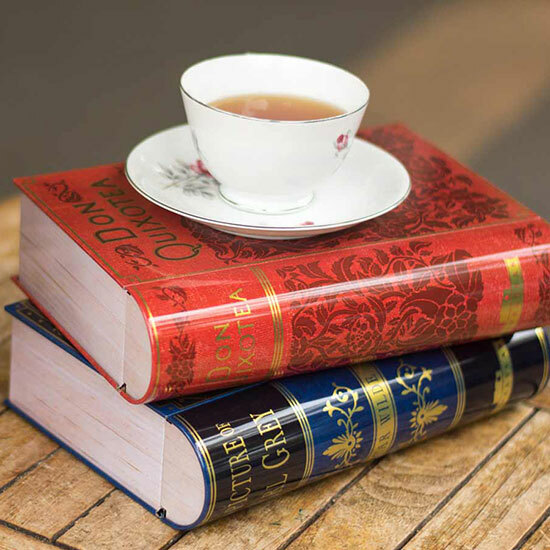 Since NovelTeas first launched, they've also introduced Jane Austen's Pride and Peppermint, William Shakespeare's Matcha Do About Nothing and Charles Dickens' Oliver Lemon Twist. If that's still not enough book/tea puns for you, Pippi Oolongstocking is going to be the next to hit the shelves. NovelTeas started in August of 2015 as a Kickstarter, which ended up raising over four times the initial $10,010 goal. Since then, NovelTeas has been working with independent artists to continue to create new literary tea flavors. Bonus literary cred: the tea tins are sold at New York's legendary STRAND Bookstore, the place that every book geek dreams of some day making a pilgrimage to. You can buy your own NovelTea tin through NovelTea's website. Or, if you're the kind of person who does all your shopping analog, which you totally might be if you're looking for tea tins shaped like books, you an use the site's store locator.